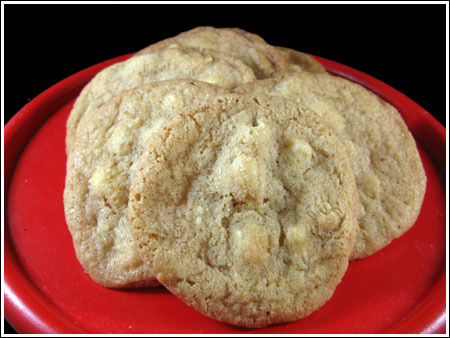 Even though I love them, I don’t make white chocolate macadamia cookies that often and am having to revisit old recipes in order to figure out which are worthy of the Top 5 list. The first recipe I’d have to add to any Top 5 list would be this one. It’s from an old collection of recipe cards given to me by my mother-in-law. These are fairly thin, chewy in the center only and have crispy edges and perimeters. If you cook them longer, they could be crispy through and through. As much as I love butter, these cookies have the best texture when made with a mixture of butter and shortening. I’ve tested these with a couple of different kinds including non-hydrogenated, and in all the tests I’ve done, regular Crisco works the best. Preheat oven to 350 degrees F (176 C). Line a couple of cookie sheets with parchment paper. Beat butter, shortening and both sugars with an electric mixer until creamy. Add egg and vanilla and beat for about 30 seconds. Scrape sides of bowl and beat in salt and baking soda. Add flour and stir until it is almost mixed in, then stir in macadamia nuts and white chocolate. Drop dough about 3 inches apart (these spread quite a bit) by tablespoonfuls onto cookie sheets. Bake for 12-14 minute or until edges are golden brown. Cool on cookie sheets for about 5 minutes, then transfer to wire racks. I like trying new ingredients, so I switch shortenings, try different flours, etc. It’s mostly in the name of experimentation and I am always happy when a supposedly more healthful ingredient works. So if I’m baking cookies for someone super health conscious, I’d use the more healthful fat. If I’m baking cookies for myself or people who thinks a little of everything is okay, then I’d use whatever. Except for lard…then I’d tell them prior…or panda fat. I let people know when I’m baking with panda. If you are chopping up Lindt or Ghiardelli bars you have cocoa butter, which is a naturally-occurring fat that is not hydrogenated and contains no trans fat. And, reading the recipe again, that’s what Anna wants you to do. 🙂 But Nestles chips are similar to this — GHIRARDELLI, WHITE CHOCOLATE BAKING CHIPS INGREDIENTS: Sugar, Partially Hydrogenated Vegetable Oil (Palm Kernel Oil, Coconut Oil, Palm Oil), Whole Milk Powder, Nonfat Milk Powder, Whey, Cream Powder, Cocoa Butter, Soy Lecithin (an Emulsifier), Vanilla. Good quality white chocolate isn’t hydrogenated, is it? I think I’m going to have to go with the “unhealthy” stuff when I make these. I don’t want to taste the shortening. Man oh man, do they look good, though. This is one of my favorite cookies, but I rarely make them. Time to change that! Anna, help me out here. Why would you consider using non-hydrogenated shortening in this recipe when the recipe uses white chocolate? I’ve never seen white chocolate which isn’t at least partially hydrogenated. Are you just trying to average out the bad stuff? You know which ones get my vote! The Masterpiece White Chocolate Macadamia Cookies! Mmmmm! No doubt these are great too.